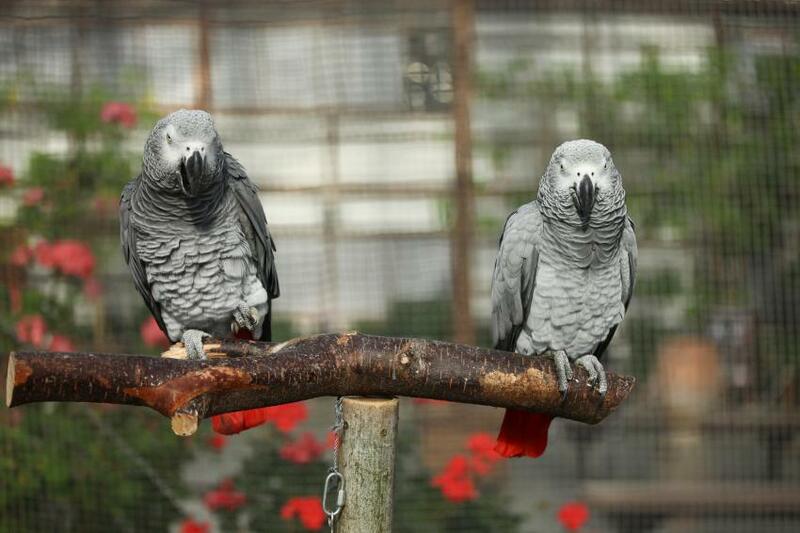 On this issue, on January 28th, we focus on Dolly and Anthony the Grey Parrot. 1월28일 오늘은 회색앵무새 도리와 안소니를 소개드리겠습니다. Usually each of them sit on a single perch, but they happened to sit on a same perch together when this picture was taken. 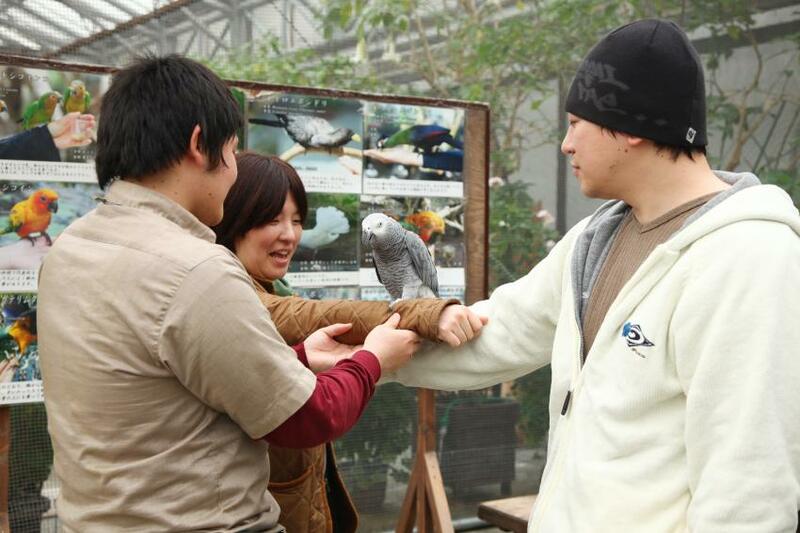 Tamer than other birds, they sit on arm or shoulder of visitors relatively easily. However, don't force them to sit on your arm when they don't react your hand coming near them, otherwise they'll bite you. 도리와 안소니는 항상 다른 나무위에 앉아 있는데 이 사진을 찍는 날에는 같은 나무위에 앉아 있었습니다.도리와 안소니는 다른 새보다도 사람과 익수가여 손님의 어깨나 팔에도 잘 올라앉습니다.하지만 손을 가까이 해도 반응이 없을 때 무리하게 팔에 앉히려고 하면 물수도 있기 때문에 무리는 금물입니다. Dolly wears a silver ring, Anthony's ring is golden. 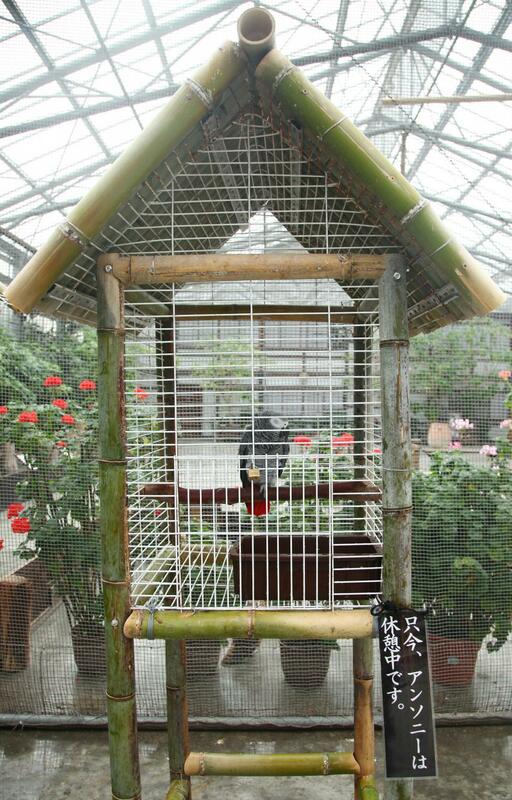 When the ring is invisible in feathers, a nearby staff member will differentiate them at your request. 다리에 은색링을 달고 있는 것이 도리이고 금색을 달고 있는 것이 안소니입니다.날개에 덮여 링이 보이지 않을 때는 부근에 있는 스탭에게 물어보면 인츰 알수 있습니다. From left to right;Subaru, Dolly and Anthony. Usually they sit in a row on the left just beyond the entrance of the Water Lily Pools Zone. 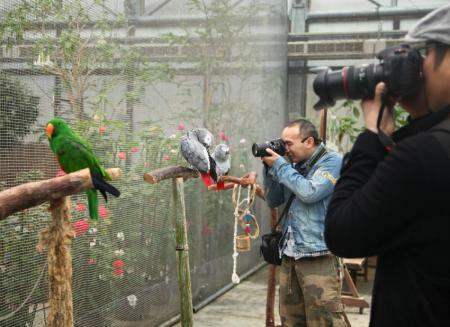 When I see some visitors taking their pictures and some children stopping in front of them to observe them for some time, I cannot help thinking that parrots have something that attracts people. 수련못존에 들어선 입구 바로 왼켠에서 항상 대기하고 있습니다.카메라로 사진을 찍고 계시는 분,자세히 관찰하고 있는 어린이를 보고 있노라면 역시 이 새들에게는 시선을 끄는 뭔가가 있구나 라고 생각하게 됩니다. You can ask a staff member to have a parrot on your arm. Anthony sometimes takes a walk around the Garden on the shoulder of Mr. Tashiro a staff member, who puts the parrot at your request. 스탭에게 말씀해주시면 이렇게 팔에 얹힐수도 있습니다.안소니는 타시로스탭의 어깨에 앉아서 원내를 자주 산보하고 있기에 희망하시는 분은 팔에 얹혀볼수 있습니다. When you see the parrot neither on the perch nor in the Garden, it should be in the roost by the perches because it is in bad condition. Please leave it alone in such cases. 나무위에도 원내 다른 곳에서도 보이지 않을 때에는 컨디션이 좋지 않아 나무옆에 있은 둥지안에서 휴식하고 있습니다.그냥 조용히 봐주셨으면 감사하겠습니다.